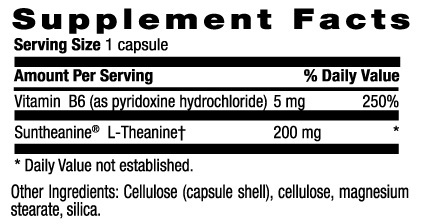 Country Life L-Theanine - L-Theanine supports relaxation and healthy nervous system function without drowsiness. It also naturally supports brain function and helps reduce stress. B-6 is added for enhanced utilization. RECOMMENDED USE: Take 1 capsule daily. This product contains NO: yeast, corn, wheat, soy, gluten, milk, salt, sugar, starch, preservatives or artificial colors. This product also contains: Cellulose (capsule shell), cellulose, magnesium stearate, silica.